7 basic vinaigrette recipes that will add so much flavor to your salads! These are ready in under 5 minutes and are so much tastier than the store-bought stuff! It’s 7 flavors time again! Today we’re talking vinaigrette recipes. A good homemade vinaigrette is often what brings the magic to a salad. 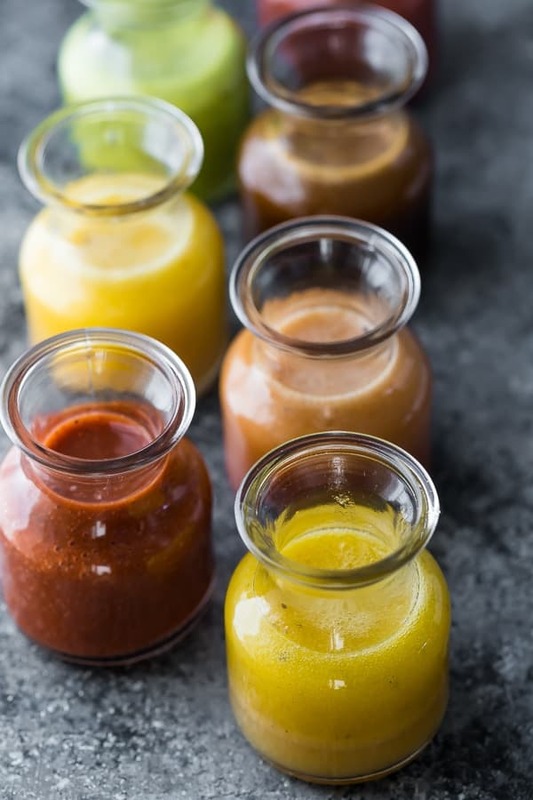 These seven vinaigrette recipes add a ton of flavor to your salad, and are incredibly simple to prepare…some of these have just 4 ingredients. Traditional vinaigrettes have an oil to vinegar ratio of 1:3, but I find this far too mild. If I’m putting the effort into making a vinaigrette from scratch, I want to be able to taste it! My vinaigrettes all have a ratio of one part oil to 1 part vinegar. On it’s own, it’s quite tangy, but adding in some dijon and maple syrup rounds it out and gives the perfect balance of sweet, savory and tangy. If you prefer a more traditional vinaigrette flavor, then switch up the ratio of olive oil to vinegar in these recipes! vinegar- you can opt for a good quality vinegar, although I just pick from my grocery store’s selection. 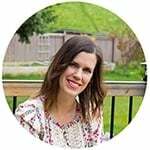 The only vinegar I’m truly picky about is apple cider vinegar, make sure to get raw and unfiltered to get all the health benefits possible from your apple cider vinegar! dijon mustard- this adds the magical pizzazz to all my vinaigrettes. Dijon acts as an emulsifier, which is fancy speak for saying it helps the oil and vinegar stay together. It also adds a certain ‘je ne sais quoi’ flavor to the dressing. Don’t skip it! maple syrup (or honey)- a little sweetness is needed to tame the tanginess. Honey and maple syrup are easily interchangeable in most vinaigrettes at the same ratio. Brown sugar also works in a pinch! 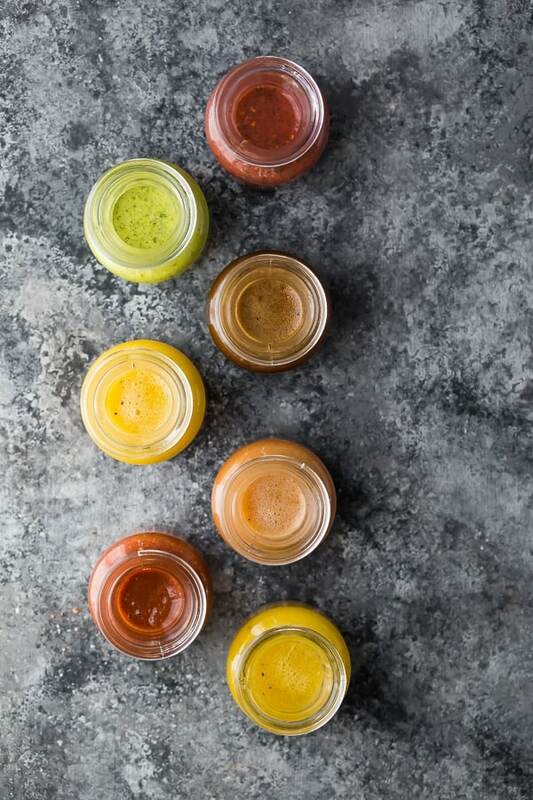 optional fruit & vegetable add ins– three of these vinaigrette recipes have fruit & veggies blended into the dressing for extra flavor. Taste and add more sweetener as needed. 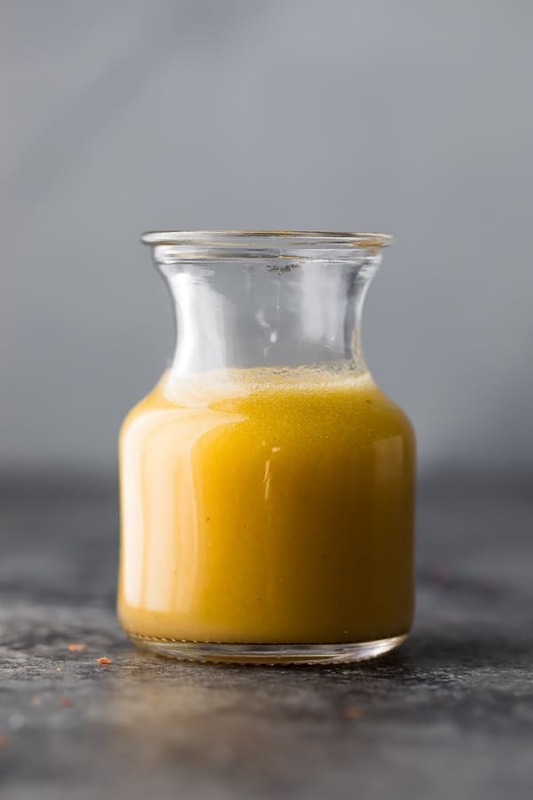 How to make vinaigrette? 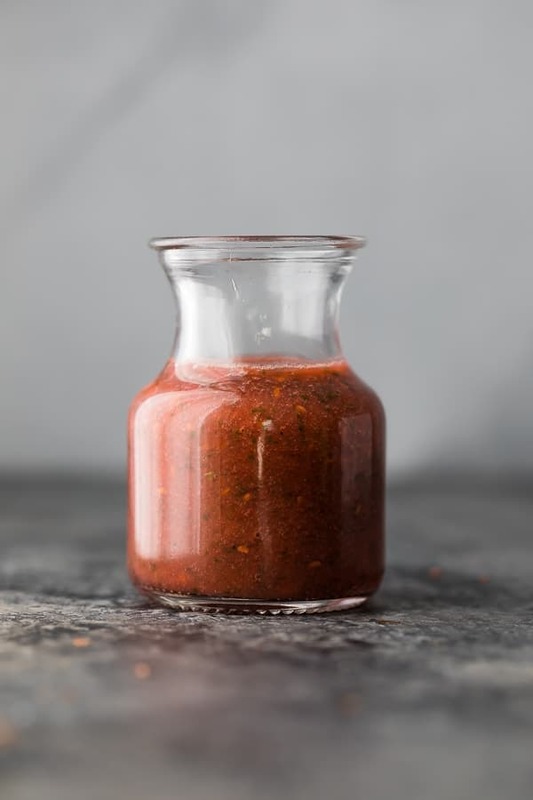 Simply shake the ingredients together, or in the case of the strawberry, raspberry and cilantro lime vinaigrettes, blend them up with an immersion blender. 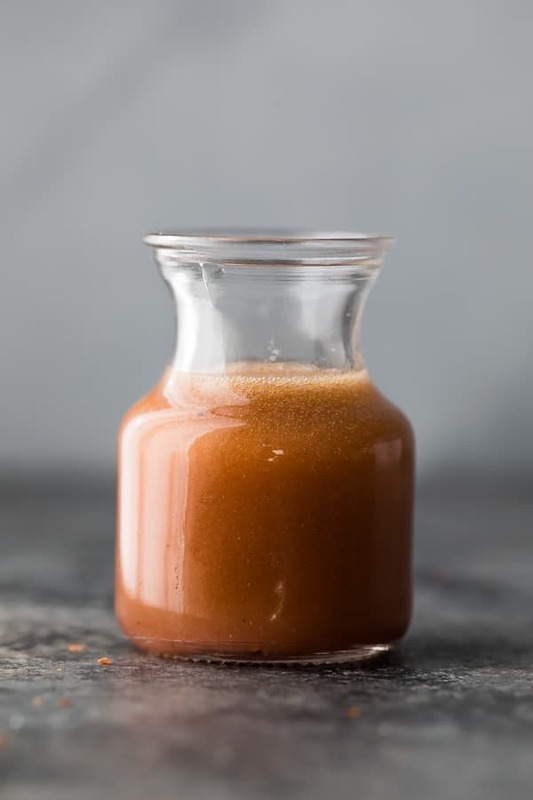 How long are these vinaigrette recipes good for? cilantro lime, strawberry and raspberry vinaigrette recipes – up to 1 week. Can you use these vinaigrettes as a marinade? Great question, and though I haven’t tried, I bet it would work out great! 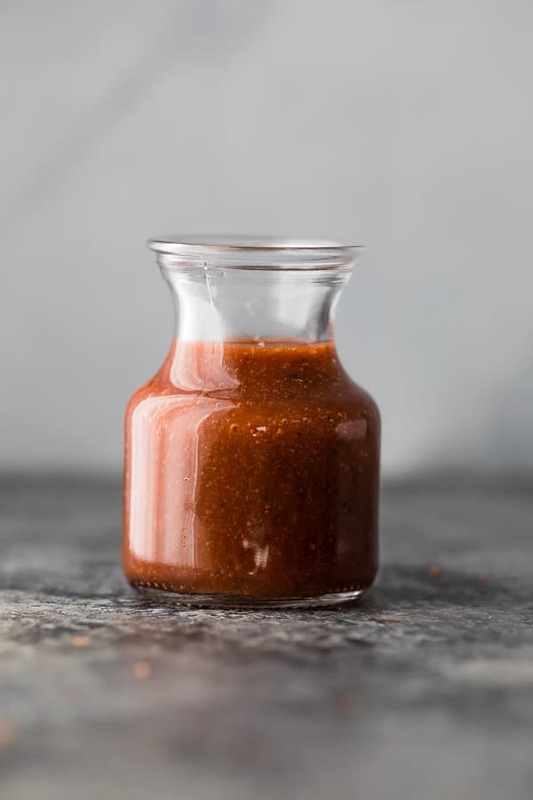 Here are 7 tried and true marinades if you’re looking. 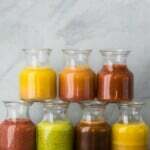 What is the difference between a salad dressing and a vinaigrette? 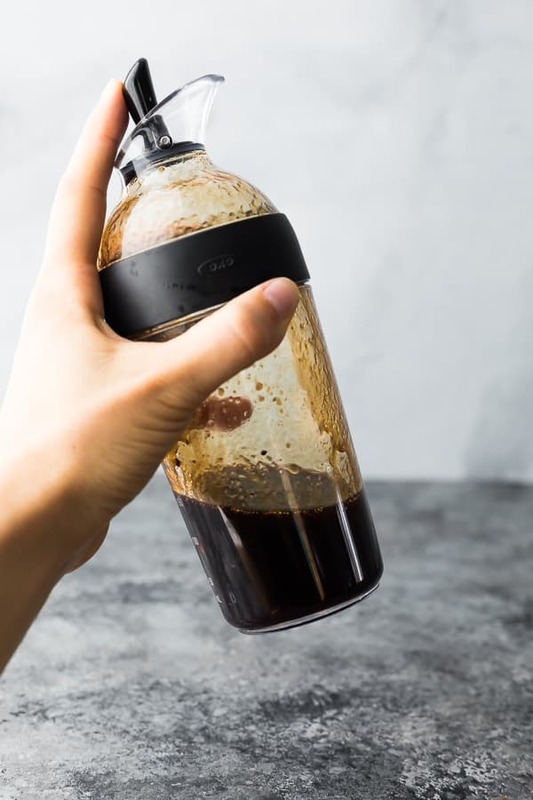 While a salad dressing can mean anything that you dress your salad with (including a vinaigrette), a vinaigrette is a specific type of salad dressing that is oil and vinegar based. 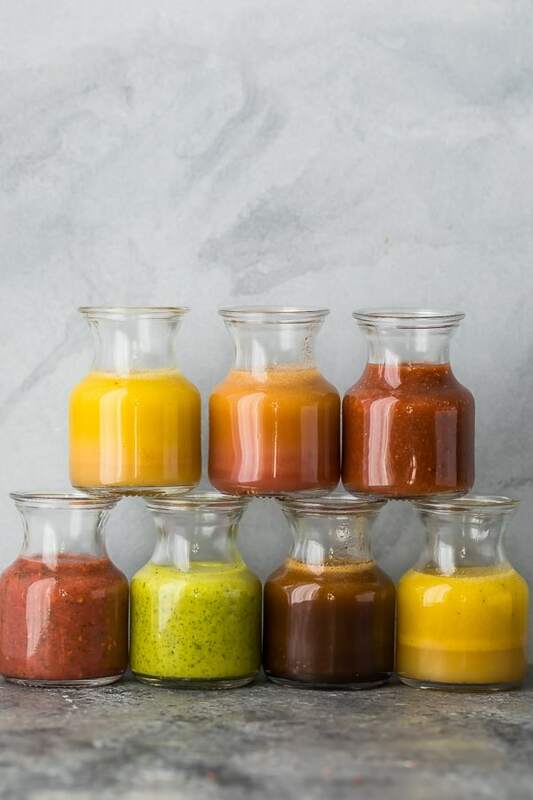 Stay tuned for 7 healthier salad dressing recipes which I hope to share with you in 2019! 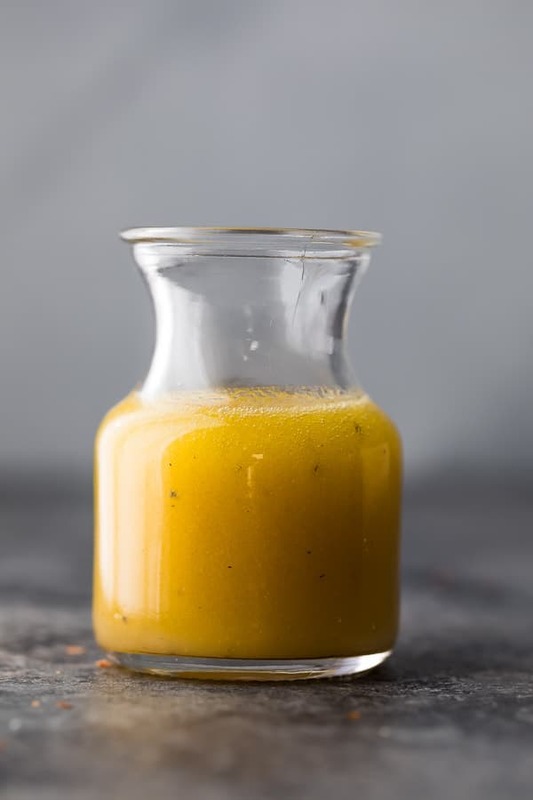 How can I jazz up these vinaigrette recipes? These recipes are for the most basic version of each vinaigrette. 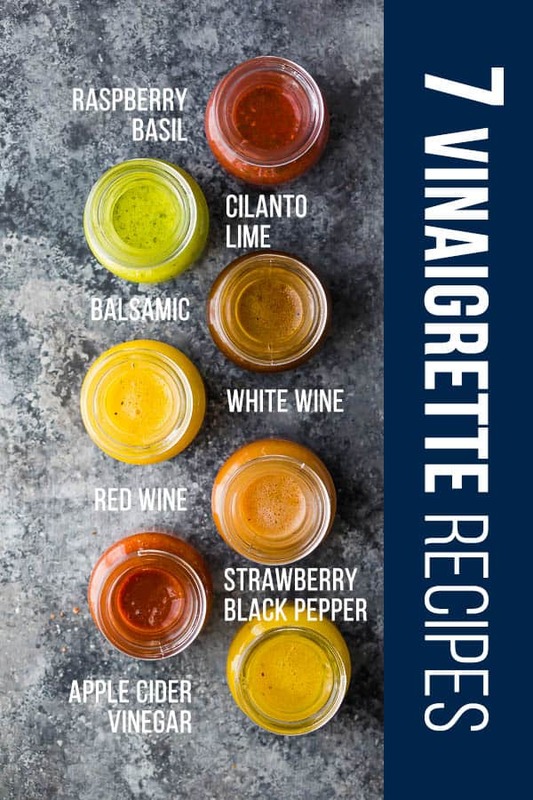 For ideas of add ins, herbs and spices you could add to them for more flavor, refer to the post linked to each vinagirette! 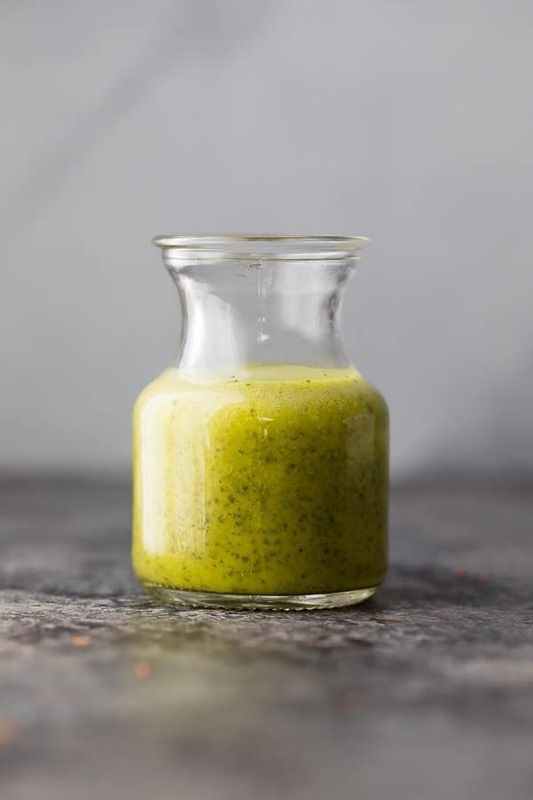 This is my all-time favorite all purpose vinaigrette recipe…it goes with practically everything! Not only that, but with only four ingredients, it’s super simple to shake up. This easy homemade red wine vinaigrette is my go-to vinaigrette recipe for pasta salads and grain-based salads, but is also great on greek salad or cabbage slaw. We are always looking for ways to enjoy apple cider vinegar since it’s so darn good for you! Adding it to a vinaigrette recipe is a great way, although it’s not *quite* as tangy as white whine vinaigrette. 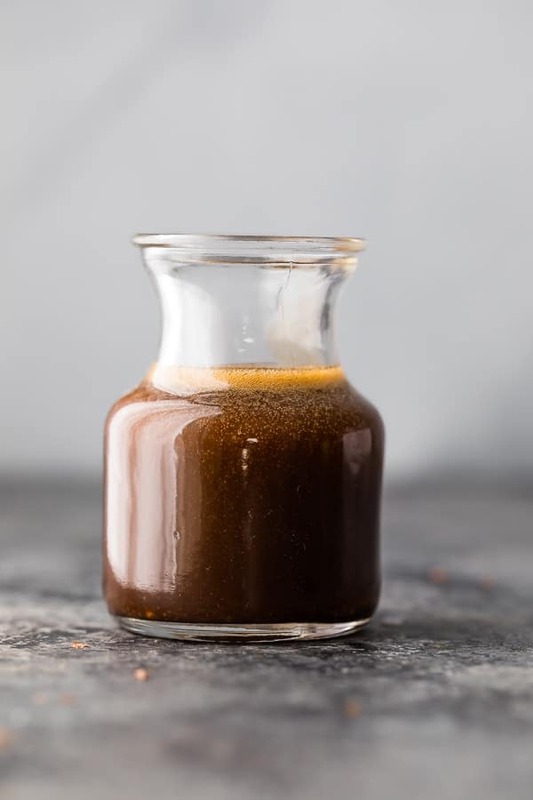 This balsamic vinaigrette recipe is almost as versatile as my favorite white wine vinaigrette. It goes well with so many veggies and has only four ingredients. Caprese salads! Tomatoes + Basil + Balsamic vingaigrette were meant to be together. Check out this Strawberry Quinoa Caprese Salad or these Caprese Chicken Salad Meal Prep Bowls. Any salad with berries! The sweet/tangy flavor contrast is to die for. This Strawberry Arugula Steak Salad is one of my all-time favorites! Fresh raspberries are blended with basil and red wine vinegar. Tangy, slightly sweet, and oil-free! Fresh cilantro is blended with garlic, lime juice, white wine vinegar and olive oil. Add in half an avocado to make it thick and creamy. Strawberries are roasted to concentrate their flavor, then blended up with fresh black pepper and tangy balsamic vinegar. Shake together all ingredients. Store in the fridge for up to 1 month. Blend together all ingredients in a blender or with an immersion blender. Store in the fridge for 3-5 days. Heat oven to 350°F. Roast strawberries for 25 minutes and allow to cool slightly. *not to be confused with white vinegar! I love your recipes. They are very easy to make and yummy. I’m you started doing more vegetarian and vegan prep meal. I’m veganish so this really helps me out a lot.